The North Eastern Locomotive Preservation Group was formed on 28 October 1966 in an upstairs room of theBridge Hotel, Newcastle, with the original intention of saving a 'J27' 0-6-0 tender engine, No 65894, at that time still in use by BR. The NELPG not only succeeded in that aim but also acquired another North Eastern workhorse, 'Q6' 0-8-0 No 63395. Both were restored to full working order and operated on the then embryonic North Yorkshire Moors Railway.The success of the NELPG led to 'K1' 2-6-0 No 62005 being presented to the Group in 1972 and this, too, was overhauled, to see a new lease of life on the NYMR, in 1974. That year saw the NELPG involved in the restoration of LMS 'Black Five' 4-6-0 No 44767, which culminated in all four locomotives participating in the never-to-be-forgotten celebrations to mark the 150th anniversary of the Stockton & Darlington Railway, at Shildon, in1975. That year was the precursor to main-line operations for both the 'K1' and the 'Black Five', and the 'K1' went on to become the most used locomotive on the highly successful steam service on the Road to the Isles between Fort William and Mallaig. In 1982 the NELPG acquired 'J72' 0-6-0 No 69023 of Railway Children fame, and this too was overhauled for use on the NYMR, as well as numerous other heritage railways around the UK. Not content with overhauling and maintaining its own locomotives, the NELPG was also involved with the two 0-6-2 tanks Nos 5 and 29 from the National Coal Board system at Philadelphia, County Durham, 'Q7' 0-8-0 No 901 from the National Collection, and the two Gresley 'Pacifics', 'A4' No 60019 Bittern and 'A2' No 60532 Blue Peter. With the exception of Bittern, all were overhauled under the auspices of the NELPG to see further use on the NYMR and, in the case of the 'A2', the main line. 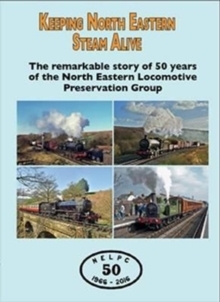 This unique book not only chronicles the 50-year history of the NELPG, augmented by a superb and varied collection of colour photographs, both before and after preservation, but gives a rare insight into what is actually involved in steam locomotive overhaul and maintenance. This is done through a series of remarkable pictures that graphically illustrate the many and varied technical processes involved in a way that words alone cannot adequately describe.